After experiencing numerous problems with fish fryers, Infraglo realised that there were a number of areas within the combustion system that needed to be considered and possibly redesigned. Most fryers were heated by atmospheric burners so the oil pans and associated exhaust flues had evolved to suit the relative inefficiency of this type of burner. To increase heat transfer most pans had studs and fins welded to them, which helped efficiency but could lead to the oil burning due to hot spots which increased stress in the pan. There was also a problem with heat recovery of the oil after cold potatoes were added which caused the chips to absorb large amounts of oil before it regained the required operating temperature. British standards demand that the efficiency should be a minimum of 50%. This initially lead to increased heat input that resulted in much higher stress on the studs and fins, which could cause premature pan failure. The increased volumes of high temperature products of combustion also lead to a significant number of fires in the fat trap of range type fryers. By considering infrared heat there was an opportunity to redesign the whole system to reduce cost and increase efficiency. After much research Infraglo developed a pre-mix system supplying a metal fibre burner operating in infrared mode that removed the necessity for any studs or fins on the base of the pan. The much reduced volume of products of combustion also allowed the flue system to be made significantly smaller. The result has been an increase in efficiency of the system upto 94% with less stress on the pan and a significant reduction in oil and gas usage of up to 60%. The chips produced are considerably more healthy as the heat recovery of the oil is much faster so the chips absorb less oil because they are cooking at much higher temperatures. If we compare heating a liquid with an infrared burner in comparison to a conventional atmospheric burner, we generally find we can reduce the output of the burner by 50% and the liquid can be heated to the same temperature in half the time. Reduced cooking time with a burner using only half the output! 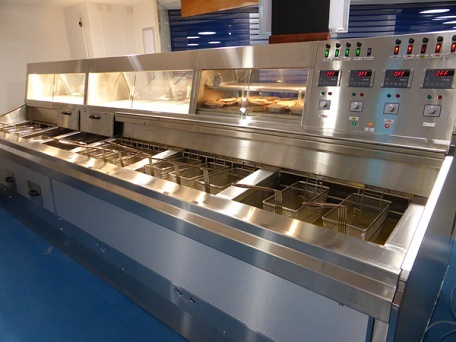 This system has been in use for several years and more UK fryer manufacturers are changing to this system as their customers demand reduced fuel and oil consumption with improved reliability.